Looking through my kitchen inspiration file today, I noticed that all the kitchens I saved had something in common. Some kitchens I saved for their unique lighting, like this one. 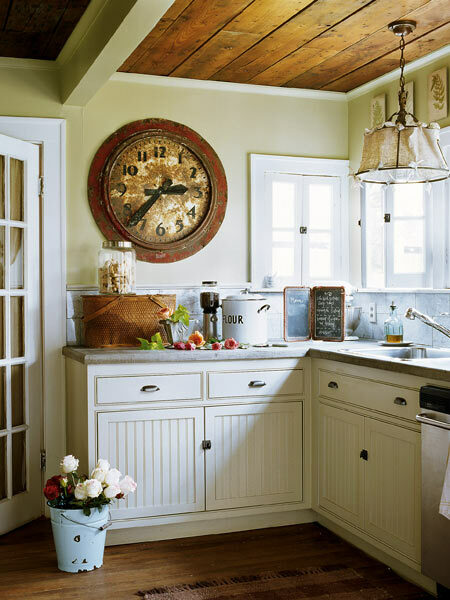 How cool is the burlap covered pendant above the sink! 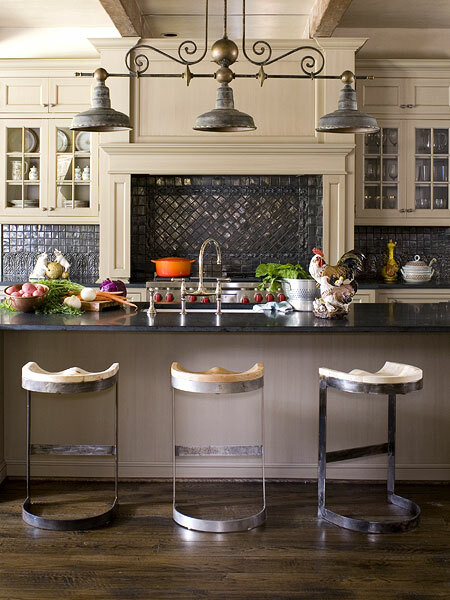 This kitchen wowed me with the galvanized pendant, but I also thought the gun metal tile backsplash looked fabulous with the soapstone countertop. More pendant inspiration! Notice the open shelves. This is also a common theme with the kitchens I'm admiring lately. Believe me, I'm so close to taking off all my cabinet doors for that open shelving look! Open shelving, wonderful pendant, commercial range--oh my! 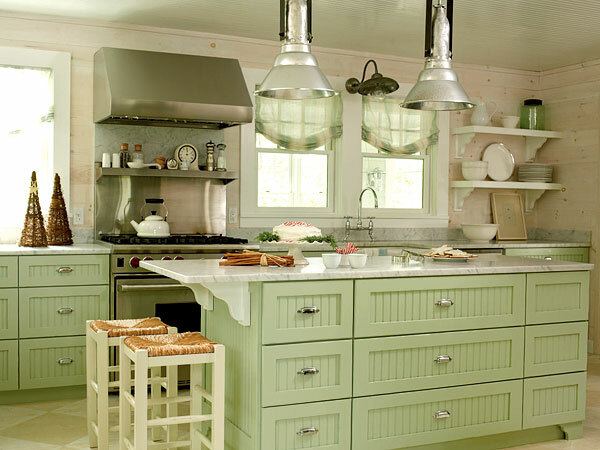 I love the open shelving here and the simplicity of this kitchen. 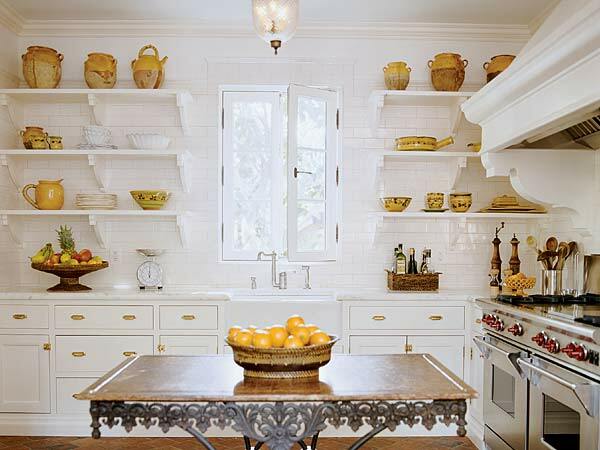 The yellow pottery really stands out against the white subway tile. My dream stove with the famous red knobs makes my heart beat fast! More open shelving. 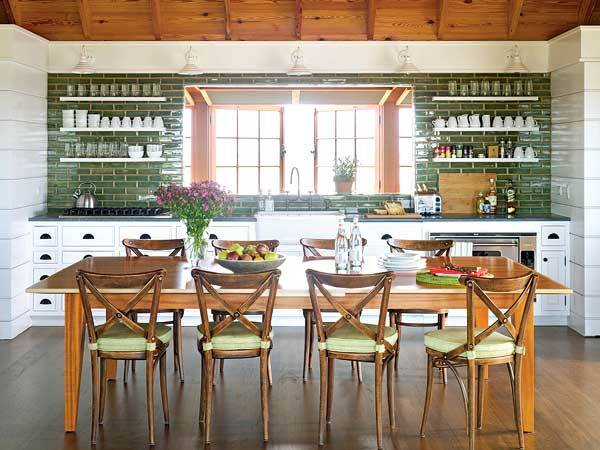 But also, I'm intrigued with the green subway tile backsplash. Who says subway tile has to be white? It could be a soft maize color! This kitchen's backsplash was the inspiration for my own kitchen. The marble countertop is currently on my wish list! I love my soft butter colored backsplash. Each tile is handmade, so there is texture in the uneven surface. At first, I thought I made a mistake, but now I love it. Wishing for that marble counter though! The countertop is "Santa Cecelia" granite. It has subtle flakes of garnet, gold, and black. What would you change in your kitchen if you had a million bucks? The countertop? The backsplash? Appliances? Would you be comfortable with open shelving? What would you choose for lighting? Uh Oh, I just deleted everyone's lovely comments. Darn! Guess I won't do that again! Delores, All of these kitchens are beautiful, including yours. What would I change? 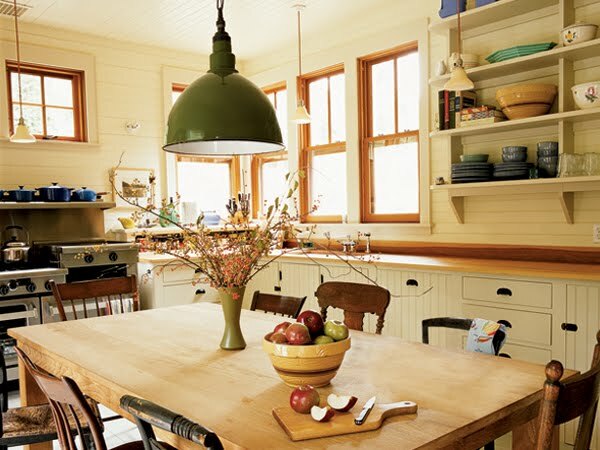 First, I would love a gorgeous wood stove hood with open shelving on each side. Then I would add beams to the ceiling and use an antique piece as an island. Bummer about the comments! Love the buttercream tile too....I also liked the glass door fridge....but in reality I could never truly live with it...I would have to line things up & have it sparkling clean all of the time...so not too practical.. I love the first kitchen!! Very french country and that is me!! One day !! Several of these kitchens were inspiration for ours. We have the open shelving (or will when it gets put up), the tile backsplash, marble counters, and commercial range...still trying to find the perfect pendants but the main kitchen light I love. I had planned and dreamt about it for what seems like forever and I have to say... I wouldn't change a thing. Thanks for the great post... what lovely kitchens. Where to begin?! I am going to have to edit my comment. 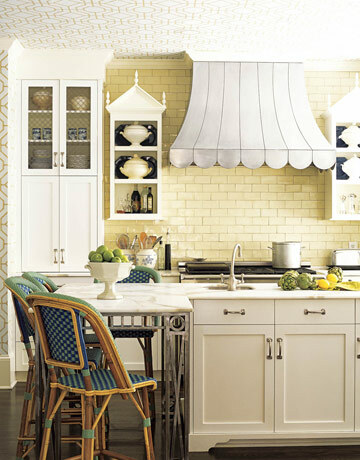 I love your butter colored subway backsplash tiles. I also have a Wolf range, I am such an indecisive weanie that I purchased the red knobs and an extra set of black knobs. I switch them out. OOh your kitchen is gorgeous and I love your cheese platter! I started collecting those last year and just can't get enough. A marble countertop is also on my wish list! So beautiful. Open shelves too! Delores, So many wonderful kitchens! I love pendant lighting and subway tile! I am dying to remodel a kitchen!